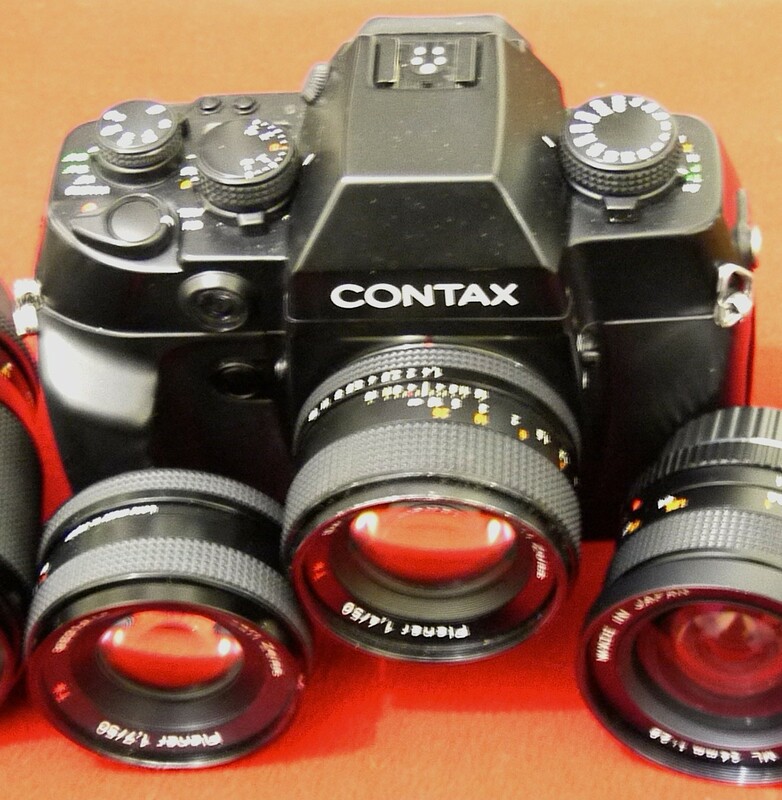 Contax AX with some of the lenses. My photography, and therefore posting on this blog, being severely limited over the past year by health problems, I’ve been thinking seriously about reducing my ‘user’ camera collection and concentrating on just a ‘few’ (well, fewer!). First move, a few weeks ago, was to change the scope of this blog to include using legacy lenses on digital (4/3) so I could post more frequently as developing/scanning was a problem. For this, my favourite lens is the Zeiss Planar 50mm, f/1.4 (with a C/Y mount). This led me to conclude that as far as SLRs are concerned I should concentrate first on Contax/Yashica. Also, having been housebound for a while, I became more interested in macro photography, so that led me to digging out the Contax AX (last used I think for a post here in July 2013), which is the only SLR which will do that without special accessories or lenses. I wrote about the AX in a previous post (https://grumpytykepix.wordpress.com/2013/01/17/contax-ax/). The AX looks massive but that is misleading; pick it up and it fits into the hands wonderfully with everything ideally to finger. And having AF with all the manual lenses is great – not fast enough for sport probably but it’s not slow – especially if like mine your eyesight is not perfect. Add to that, instant availability of macro with any lens. It’s an amazing piece of engineering. It was all possible due to Kyocera’s (Kyoto Ceramics) expertise with ceramics. So, on Saturday last – sunny enough to be ideal for B&W – I set out for a short walk (I can only do short, yet) with the AX loaded with Acros 100. First shot, of some tree stumps, was fine. Next shot, up went the mirror and stayed there. Removing the lens and pressing the shutter release brought it down. Lens back on and try again; mirror stayed up. I thought I recognised the infamous ‘mirror slip’ symptoms, though I have never before experienced them. End of photography for the day (very unusual for me, I did not have the CX-2 in my pocket). Back home, examining the mirror in its mounting plate it seemed to be protruding a little from the front, maybe 1mm, and this seemed to confirm the ‘mirror slip’ problem, ie, if the camera is stored base down for a long period, as would be natural, and even for a short period if if gets warm (eg, left in a closed car on a sunny day so the adhesive (actually double-sided tape) used to stick the mirror to its mounting plate can soften) the mirror can slip down a little. It then fouls something and stays up on release. It’s easy enough to fix (though most repairers will charge you a lot of money). Out with my wife’s hair dryer. With the mirror held up (there’s no mirror lock up on the AX so it’s done by turning to ‘bulb’ and keeping a finger on the release button), hot air is blown into the mirror box; after two or three minutes some movement of the mirror can be felt when pressing carefully with a finger nail; a little sustained pressure and the mirror can be moved back until it no longer overlaps the edge of the mounting plate. Now the longest part of the process: keep the mirror up until the mounting no longer feels warm so the adhesive has set again (about 15 mins for me, for safety). Job done. The mirror will probably stay there now for longer than I’m on earth but a bit of ‘belt and braces’: I carefully applied two minute spots of nail varnish (red so that it is clear to any future user) to either side of the front of the mirror/mounting interface. You just have to be very careful not to touch the face of the mirror. More ‘belt and braces’: I dug out the Yashica FX-3, a completely mechanical camera apart from very simple + or – metering, and I will carry that as a back-up on any important trip. The most important disadvantage for me will be the 1/1000 minimum shutter speed, against the 1/6000 of the AX, because I often favour wide apertures for differential focus. Although from the days of proper metal bodies, the FX-3 is compact and quite light. It will, of course, take all the Contax lenses. Close examination reveals no sign of mirror slip here but the mirror buffer sponge – sticky – could do with renewing, a few minutes job. The seals inside the back look and feel like new – I must have done them sometime in the past. Despite down-sizing I’d like to add a Contax T? compact for the pocket as, great as it is, the CX-2 is rather heavy for the pocket, but prices of the Contax Ts are silly. Having said that. I couldn’t justify spending on my Zeiss lenses if I had to buy them now (or even some of the Yashicas). I also have a Contax SL300R-T* digital; tiny, I use it as a notebook for my blogs and 3Mpixels is enough for most pictures for general blogging. Not all my C/Y lenses are Zeiss (mostly because of cost but the Yashica 24mm is an exception). My prime lenses for Contax/Yashica are: Vivitar 19mm, f/3.8 ; Yashica ML 24mm, f/2.8 (better than the 25mm Distagon – Zeiss seems unusually to have messed up here); Zeiss AE Distagon 28mm, f/2.8; Yashica ML 35mm, f/2.8; Zeiss AE Planar 50mm, f/1.4; Zeiss MM Planar 50mm, f/1.7; Yashica ML 55mm, f/2.8 macro; Tamron Adaptall 90mm, f/2.5; Zeiss AE Sonnar 135mm, f/2.8; Yashica ML 200mm, f/4. Then there’s a zoom, a Yashica MC 100-300mm, f/5.6 – 6.7 (a later lens, more compact and much lighter than the 200mm prime); Yashica 2x tele-converter (the Zeiss are crazy prices). Why two 50mm Planars? The AX can be used with speed priority or program modes with the MM lenses, but not with the AEs (according to spec but not strictly true, the camera can be fooled into allowing Tv and P with a short length of matchstick!). A f/1.4 MM was quite a lot more than an AE so I settled for that, but kept the f/1.7 MM. The long Yashica zoom, the most likely to be used with Tv, has the appropriate tab. Various bits and pieces complete the Contax/Yashica drawer: a D-8 back for the AX which will print exposure data of each exposure on the film (or time/date if you prefer) and provide time-lapse photography; a Yashica eyepiece magnifier (I’d really like a right-angled viewer for macro); short and long Contax release cables; and a Contax TLA360 flash. I have never liked zooms, especially those with variable ‘f’ (even on the 4/3 Olympus Pen I rarely take the 14mm prime off except for the Planar), but have picked up a few in the past when they were very cheap and I didn’t have the appropriate prime, especially for long telephoto which, again, I rarely use. So, for the moment, I’ll keep the 100-300mm, another reason for keeping it being that I have an eyepiece which turns it into a telescope. Most zooms will be going now. So, as the first stage of my down-sizing, most of my other film Contaxes – three 139s – and Yashicas – an FR, two FR-1s and an FX-D will be going (some may not be working). Lenses probably to go are a Vivitar 17-28mm, f/4-4.5, a Yashica ML 28mm, f/2.8 and a Mitakon 28mm, f/2.8. Confession: I have a Contax RTSII tucked away with a real time winder and interval timer. I can’t yet bring myself to part with that but I’ll have to begin to use it to justify that decision. I also have more than one of what must be the ugliest camera ever made – the Yashica AF-230 – together with several AF lenses, multipliers and extension tube and an excellent Yashica flash similar to the Contax. Not the 60mm AF lens unfortunately, it’s always been too costly for me. I’ll have to think more about these (focussed near the entrance of the bluetit’s nesting hole seen from my kitchen window, the AF-230 can be set to trigger when the bird flies into the focus zone). I still tire very rapidly but yesterday was the first day without pain since surgery a month ago so later this week I hope to develop a few films for the first time for about a year including, maybe, the one in the AX now. After that I’m going to concentrate on using the AX for a while, putting off difficult decisions about my collection of Olympus OMs, XAs, and others. Can you confirm something which has surprised me? You refer to a Yashica MC 100-300 f5.6-6.7 zoom and I’ve never heard of this lens. I’m familiar with the ML 100-300 f5.6 but not a MC (Compact) version – I assume it was made late in the day by Cosina. Thanks. Damn indeed Derek. If you weren’t so far away I’d quite likely pack up all the ‘to go’ stuff and send to you to repair, use or whatever rather than all the hassle with eBay. Maybe once I’ve sorted everything I’ll see is there’s a camera show close by with a cheap table. 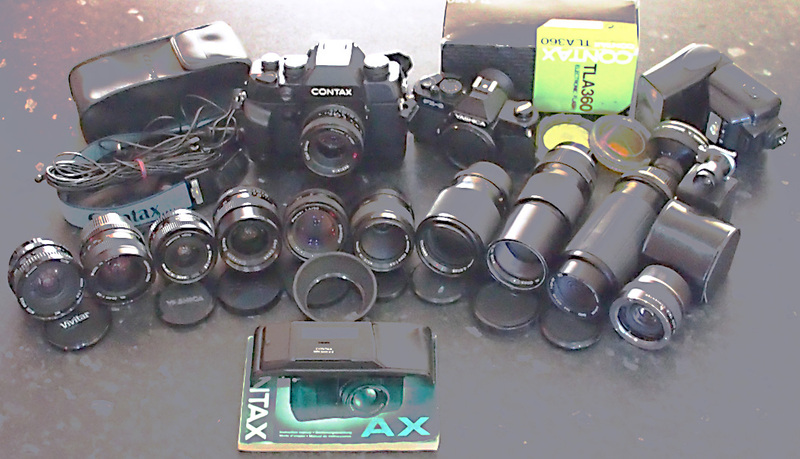 The glass for Contax/Yashica is the most comprehensive I’ve got; for most I’ve only got one or two lenses though I do have a few more than that for the OMs. Damn. That’s an impressive set up.